You would think that I have seen all that there is to see when in comes to paper beads. I find myself constantly surprised to find how many different beads you can make out of paper! How many kinds of paper are out there, thousands. I would like to take on the challenge of giving life to ordinary paper. Today, Paper to Paper Bead Idea # 1 is made out of gift wrapping paper. 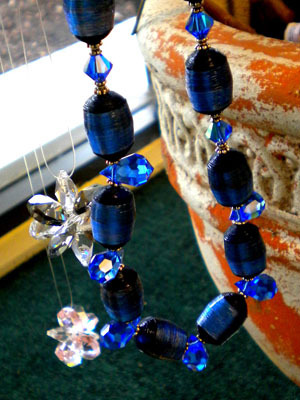 I call these beads Sapphire Blue Beads because the color is very similar to the Swarovski tear drops that are sapphire blue. You can make these into a bracelet or go for the bling and incorporate crystals. I laid it down on a beading board, to see how it will look like. 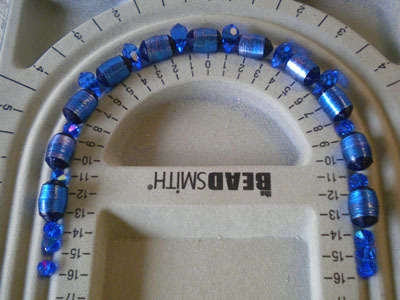 To me, the beading board is great for planning your design, and measuring your necklace. It is hard to tell they are paper beads, don’t you think? The shiny gift wrapping paper in gold would be just perfect for the season, I just found some from my stash last year. How many Paper to Paper Bead Idea do you think can I come up with? The first 15 readers to leave me a comment will be entered into a raffle drawing for a bead board that I am giving away to one lucky girl . I am completely amazed at the vibrancy of color! i am also happy to see that with that sort of gift wrap, it could be made into a bead, you did a wonderful job!!! I love the depth of light! What i have found with some gift wraps esp the iridescent ones. is that they have a plastic type coating.. or are made of a slippery crunchy plastic. Does diamond glaze work on any type of plastic coated paper? Oh btw the chandelier earrings you made in green glitter are incredible, I would love to see some SUPER Large donut beads. Oh goodie, I’m not too late for the giveaway!!! I am gonna guess that you can come up with 50 ideas…just in time for Christmas too! I really love everything you’ve done so far (3). I do not own a beading board yet. Yee-haw! Very inspiring!! 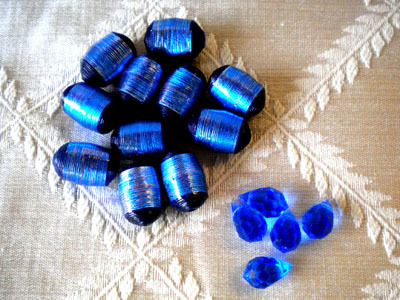 I look at gift wrapping now for beads! It is fun cutting the paper in many sizes to get different size beads. Your work is beautiful. I don’t know how you do it. You could do something similar to “Julie & Julia”. 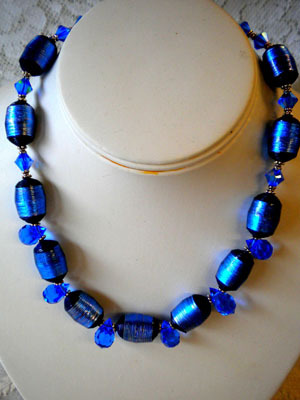 Maybe instead of a new bead design every day, try to come up with a new one every week. That would make 52 for the next year. Maybe when I have a little more experience I’ll give it a try also. I love how they turned out, they don’t look like paper beads at all, more like glass beads! I love it! 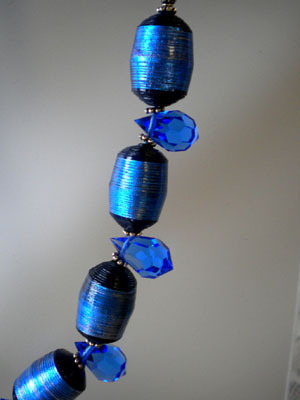 Thanks so much for the ideas, I always thought that paper beads were something that you make when you are little, but these are so “grown up”! The beads turned out fantastic! You are such a creative person I am going to say 80 ideas. I can’t imagine how many ideas you come up with. I am just happy that you will share them with me! Okay, let’s say a dozen, 12 ideas. I think the paper to paper beads ideas are almost limitless with all of the different types of paper available, including my favorite, junk mail! But I have to say at least 50 to put a number on it. Also, Janice, where do we send our beads for the trade? I’ve checked back through the postings and couldn’t find where to send them. Thanks. I’m guessing 20 or 30! Keep posting! The beads are gorgeous! There is definitely no limit to what can be done with paper. The only limit to creativity is your imagination. I think you will come up with 15. Those paper beads turned out awesome! They certainly don’t look like paper beads! You always amaze me Janice with your ideas! I’m going to guess 25 for your paper to paper bead ideas. Also Love that Necklace! I think I’ll guess more than 100! You have some really original ideas already out there, and I’m certain that you have lots more! I agree with papelhilo, you never cease to amaze us with your creativity! And I am going to ditto her guess of at least 20 paper to paper bead ideas. you seem to me to have always new ideas, so I think you will show us more and more Paper to paper Bead ideas ! well, I would say : 20 at least ! !